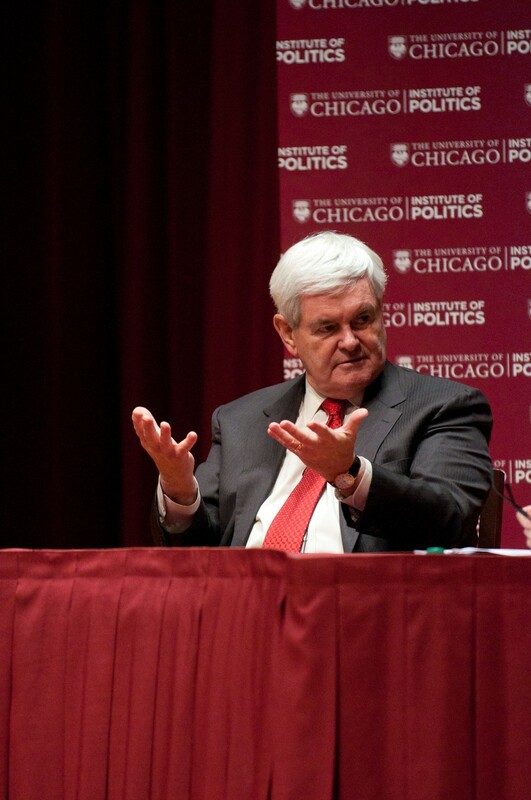 2012 presidential candidate and former Speaker of the House Newt Gingrich discussed the recent presidential election and the future of the Republican Party in a conversation with David Axelrod (A.B. ’76) at Mandel Hall this past Tuesday. In the conversation, Gingrich criticized his party for perceived missteps before and during the campaign. However, he argued that the Republican Party does not need to completely reinvent itself to maintain support. “Anybody who thinks we are dealing with a cosmetic problem is fundamentally out of touch with the real world. The Republican Party is in a very serious challenge, and we have to really, profoundly rethink how we operate and the country we’re operating in,” he said. “[Republicans are] being told by the news media that the definition of change is to become a liberal party. Why don’t you become a party that the New York Times editorial board will like? Well, we already have a party that the New York Times editorial board likes…. Is there a Republican Party that can compete with people under 30? Yeah,” he said. Gingrich spoke to the Maroon after the event about where Republicans fell short in the 2012 election and how he believes they can recover in future elections. Chicago Maroon: You talked a lot about some of the causes of the Republican losses in the 2012 election. What would you say the main cause was? Newt Gingrich: I think that we failed to understand the complexity of the country we’re now competing in, and we failed to understand how to offer a better, positive solution. For example, if Latinos were concerned about health care and therefore liked Obamacare, we had an obligation to offer them a better health care solution, not just to say no to Obamacare. CM: You talked with David Axelrod about allowing unlimited donations to candidates. Money played a big role in your primary and in the general election. Can you elaborate a little bit on your proposal? NG: I think it is clear under the Supreme Court decisions that the right of free speech has to include the right to spend money. Therefore, your choice is to allow people to give the money directly to a candidate, or to let them go off and spend it on these Super PACs. I think we’d be much healthier to have the money go to the candidate as long as it’s reported every night on the Internet, so you know who’s supporting each candidate. CM: You’ve been very forceful in taking on your party after this election. Has that caused any problems or any rifts for you? NG: No, but I’ve been very forceful in taking my party on since I first ran for office in 1974. I think you need to have a reform wing of the Republican Party that’s prepared to think and prepared to talk about ideas. If that makes some people uncomfortable, that’s their problem.